This is an IHRSA featured post, brought to you by HydroMassage. Ancillary income is always second priority to membership dues, but you’re leaving money on the floor if you don’t have a strategy for non-dues income growth. These days, a lot of club owners are singing the non-dues revenue blues. Extra income streams keep getting harder to find. With changing consumer habits, fluctuations in disposable income, and increased competition from non-traditional fitness start-ups, finding a supplementary service that clicks with your members is more challenging then ever. You need a plan. Ancillary income is always second priority to membership dues—as it should be—but you’re leaving money on the floor if you don’t have a strategy for non-dues income growth. A good place to start, says Kevin McHugh, COO of The Atlantic Club, is to do your homework. Whatever program you go with, McHugh stresses that club operators need to maintain perspective. In an IHRSA seminar “Non-Dues Revenue: Management & Growth Strategies,” Merritt Clubs COO Mark Miller says that clubs should aim for a 70/30 split of membership fees to ancillary income, and set an ultimate goal of 60/40. To get there, he recommends taking advantage of your club’s strengths by determining what you do well. That includes tapping into a sometimes ignored resource: club staff. “When looking for new ideas or innovations, it is sometimes best to look into people’s passions—the things people do when not in the club,” says Miller. So you know you need non-dues income streams. But what exactly should you do? In a recent article in Club Business International, writer Lilly Prince offered up ideas for ways to increase non-dues revenue. Here are few of them. Boutique in a club—Is there a new trend that may appeal to your clientele that you could easily adapt to your space? A boxing or martial arts section in the gym, a functional fitness program, or other boutique offering—with minimal investment—may do the trick. Enlist corporate partners—Some clubs have teamed up with meal delivery companies or other healthy food outlets. This is a natural partnership for the fitness-minded. Makeover programs—Some clubs have found success by inviting nonmembers who live in the community to participate in fitness programs. One club tried a 90-day health promotion where 91% of the participants signed up for a membership. Fitness traveling kits—When members hit the road, a lot of them need help staying on track with their fitness efforts. One club found that offering a small, club-branded tote bag with portable workout tools appealed to members, who scooped them up when going on the road. High-tech assessments—Bringing in electronic full-body scanners and similar services can be a hit with tech-savvy members looking for detailed physical assessments. Perhaps the best category for non-dues revenue growth is the wellness market. People are increasingly gravitating to recuperative therapies and calming techniques that fall under the “mindfulness” philosophy of self-care. Compare that to the once common gym-culture service of tanning beds. Club operators liked tanning beds because of the healthy ROI from the low costs of operation after the initial investment. Because of changes in health care regulations (the Affordable Care Act puts a tax on tanning services) and concerns about skin health, tanning services are not the revenue generator they once were. Many clubs have found success replacing the space they used for tanning beds with HydroMassage beds and lounges. 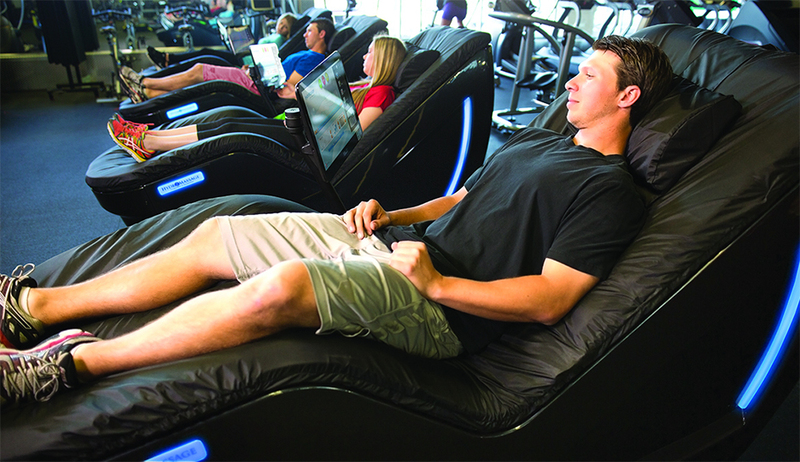 Originally utilized by chiropractic, physical therapy, and rehab facilities, HydroMassage lounges are popping up in health clubs all over the world. Using warm-water massage to promote recovery and relaxation, HydroMassage machines are reliable crowd-pleasers that fit into the wellness theme. Stress relief is in high demand, and HydroMassage treatments fit the bill for club members of all ages. That’s not the case with other non-dues offerings like functional fitness services and food-delivery partnerships. Almost everybody loves a massage, whether they have aches and pains or just need to chill after a tough commute. You can utilize HydroMassage machines in a number of ways, either as part of a premium package or offered for an extra fee. Either way, the demand for HydroMassage therapy will help you easily pay off your initial investment and be a reliable supplemental income stream for years. HydroMassage lounges and beds are also a great recruitment tool. Having potential new members experience a relaxing, massage treatment can go a long way to closing a sale. And you don’t need specially trained personnel to operate them. To find out more about HydroMassage beds and lounges, visit their website, or call them at 1-800-699-1008.